← 2013: Beginning of Long-Term Recession? Figure 1. US crude oil prices (based on average prices paid by US refiners for all grades of oil based on EIA data) converted to 2012$ using CPI-Urban data from the US Bureau of Labor Statistics. In fact, the new “tight oil” sources of oil which are supposed to grow in supply are still expensive to extract. If we expect to have more tight oil and more oil from other unconventional sources, we need to expect to continue to have high oil prices. The new oil may help supply somewhat, but the high cost of extraction is not likely to go away. Why are high oil prices a problem? 1. It is not just oil prices that rise. The cost of food rises as well, partly because oil is used in many ways in growing and transporting food and partly because of the competition from biofuels for land, sending land prices up. The cost of shipping goods of all types rises, since oil is used in nearly all methods of transports. The cost of materials that are made from oil, such as asphalt and chemical products, also rises. If the cost of oil rises, it tends to raise the cost of other fossil fuels. The cost of natural gas extraction tends to rises, since oil is used in natural gas drilling and in transporting water for fracking. Because of an over-supply of natural gas in the US, its sales price is temporarily less than the cost of production. This is not a sustainable situation. Higher oil costs also tend to raise the cost of transporting coal to the destination where it is used. Figure 2. 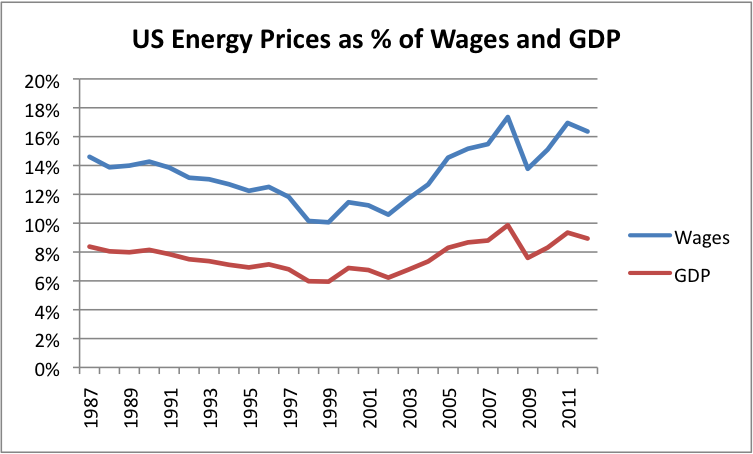 US Energy Prices as % of Wages and as of GDP. Ratio to GDP provided by EIA Short Term Economic Outlook – Figure 27, converted to Wage Base by author, using same wages as described for Figure 3. Figure 2 shows total energy costs as a percentage of two different bases: GDP and Wages.1 These costs are still near their high point in 2008, relative to these bases. Because oil is the largest source of energy, and the highest priced, it represents the majority of energy costs. GDP is the usual base of comparison, but I have chosen to show a comparison to wages as well. I do this because even if an increase in costs takes place in the government or business sector of the economy, most of the higher costs will eventually have to be paid for by individuals, through higher taxes or higher prices on goods or services. 2. High oil prices don’t go away, except in recession. We extracted the easiest (and cheapest) to extract oil first. Even oil company executives say, “The easy oil is gone.” The oil that is available now tends to be expensive to extract because it is deep under the sea, or near the North Pole, or needs to be “fracked,” or is thick like paste, and needs to be melted. We haven’t discovered cheaper substitutes, either, even though we have been looking for years. In fact, there is good reason to believe that the cost of oil extraction will continue to rise faster than the rate of inflation, because we are hitting a situation of “diminishing returns”. There is evidence that world oil production costs are increasing at about 9% per year (7% after backing out the effect of inflation). Oil prices paid by consumers will need to keep pace, if we expect increased extraction to take place. There is even evidence that sweet sports are extracted first in Bakken tight oil, causing the cost of this extraction to rise as well. 3. Salaries don’t increase to offset rising oil prices. Most of us know from personal experience that salaries don’t rise with rising oil prices. In fact, as oil prices have risen since 2000, wage growth has increasingly lagged GDP growth. 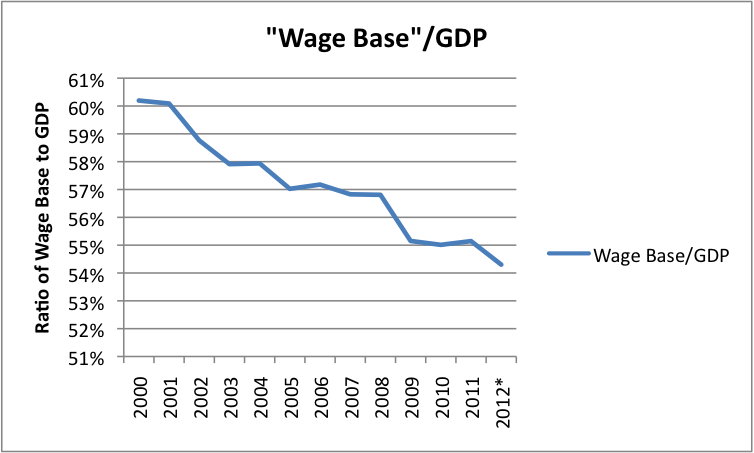 Figure 3 shows the ratio of wages (using the same definition as in Figure 2) to GDP. Figure 3. Wage Base (defined as sum of “Wage and Salary Disbursements” plus “Employer Contributions for Social Insurance” plus “Proprietors’ Income” from Table 2.1. Personal Income and its Distribution) as Percentage of GDP, based on US Bureau of Economic Analysis data. *2012 amounts estimated based on part-year data. If salaries don’t rise, and prices of many types of goods and services do, something has to “give”. This disparity seems to be the reason for the continuing economic discomfort experienced in the past several years. For many consumers, the only solution is a long-term cut back in discretionary spending. 4. Spikes in oil prices tend to be associated with recessions. Economist James Hamilton has shown that 10 out of the last 11 US recessions were associated with oil price spikes. When oil prices rise, consumers tend to cut back on discretionary spending, so as to have enough money for basics, such as food and gasoline for commuting. These cut-backs in spending lead to lay-offs in discretionary sectors of the economy, such as vacation travel and visits to restaurants. The lay-offs in these sectors lead to more cutbacks in spending, and to more debt defaults. 5. High oil prices don’t “recycle” well through the economy. Theoretically, high oil prices might lead to more employment in the oil sector, and more purchases by these employees. In practice, this provides only a very partial offset to higher prices. The oil sector is not a big employer, although with rising oil extraction costs and more US drilling, it is getting to be a larger employer. Oil importing countries find that much of their expenditures must go abroad. Even if these expenditures are recycled back as more US debt, this is not the same as more US salaries. Also, the United States government is reaching debt limits. Even within oil exporting countries, high oil prices don’t necessarily recycle to other citizens well. A recent study shows that 2011 food price spikes helped trigger the Arab Spring. Since higher food prices are closely related to higher oil prices (and occurred at the same time), this is an example of poor recycling. As populations rise, the need to keep big populations properly fed and otherwise cared for gets to be more of an issue. Countries with high populations relative to exports, such as Iran, Nigeria, Russia, Sudan, and Venezuela would seem to have the most difficulty in providing needed goods to citizens. 6. Housing prices are adversely affected by high oil prices. If a person is required to pay more for oil, food, and delivered goods of all sorts, less will be left over for discretionary spending. Buying a new home is one such type of discretionary expenditure. US housing prices started to drop in mid 2006, according to data of the S&P Case Shiller home price index. 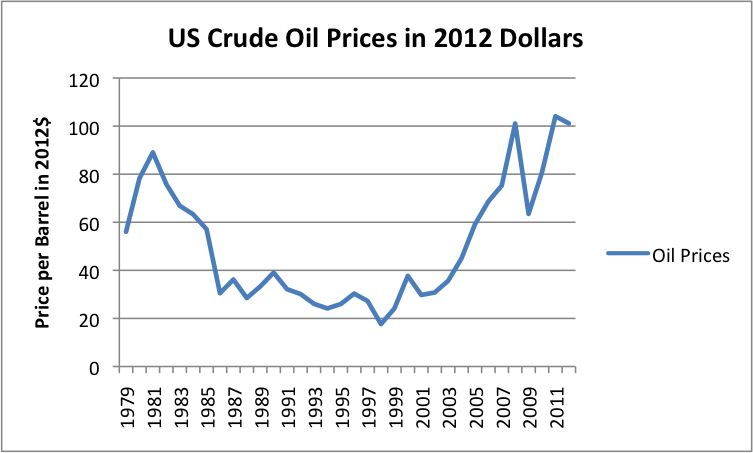 This timing fits in well with when oil prices began to rise, based on Figure 1. 7. Business profitability is adversely affected by high oil prices. Some businesses in discretionary sectors may close their doors completely. Others may lay off workers to get supply and demand back into balance. 8. The impact of high oil prices doesn’t “go away”. Citizens’ discretionary income is permanently lower. Businesses that close when oil prices rise generally don’t re-open. In some cases, businesses that close may be replaced by companies in China or India, with lower operating costs. These lower operating costs indirectly reflect the fact that the companies use less oil, and the fact that their workers can be paid less, because the workers use less oil. This is a part of the reason why US employment levels remain low, and why we don’t see a big bounce-back in growth after the Great Recession. Figure 4 below shows the big shifts in oil consumption that have taken place. Figure 4. 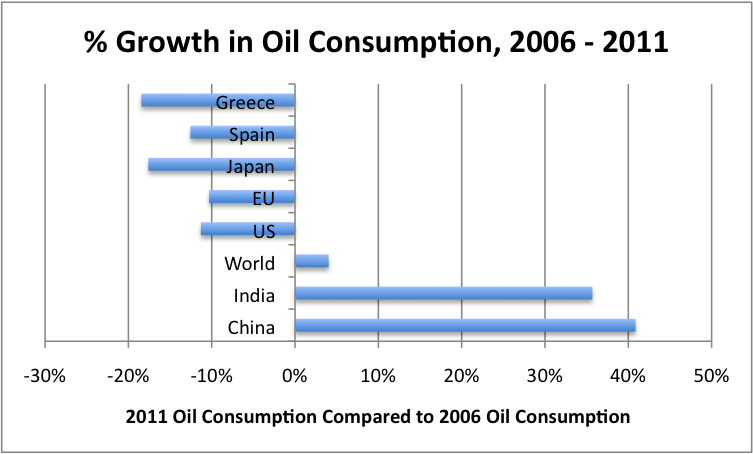 Percentage growth in oil consumption between 2006 and 2011, based on BP’s 2012 Statistical Review of World Energy. A major part of the “fix” for high oil prices that does takes place is provided by the government. This takes place in the form of unemployment benefits, stimulus programs, and artificially low interest rates. Efficiency changes may provide some mitigation, as older less fuel-efficient cars are replaced with more fuel-efficient cars. Of course, if the more fuel-efficient cars are more expensive, part of the savings to consumers will be lost because of higher monthly payments for the replacement vehicles. 9. Government finances are especially affected by high oil prices. With higher unemployment rates, governments are faced with paying more unemployment benefits and making more stimulus payments. If there have been many debt defaults (because of more unemployment or because of falling home prices), the government may also need to bail out banks. At the same time, taxes collected from citizens are lower, because of lower employment. A major reason (but not the only reason) for today’s debt problems of the governments of large oil importers, such as US, Japan, and much of Europe, is high oil prices. Governments are also affected by the high cost of replacing infrastructure that was built when oil prices were much lower. For example, the cost of replacing asphalt roads is much higher. So is the cost of replacing bridges and buried underground pipelines. The only way these costs can be reduced is by doing less–going back to gravel roads, for example. 10. Higher oil prices reflect a need to focus a disproportionate share of investment and resource use inside the oil sector. This makes it increasingly difficult to maintain growth within the oil sector, and acts to reduce growth rates outside the oil sector. There is a close tie between energy consumption and economic activity because nearly all economic activity requires the use of some type of energy besides human labor. Oil is the single largest source of energy, and the most expensive. When we look at GDP growth for the world, it is closely aligned with growth in oil consumption and growth in energy consumption in general. In fact, changes in oil and energy growth seem to precede GDP growth, as might be expected if oil and energy use are a cause of world economic growth. Figure 5. 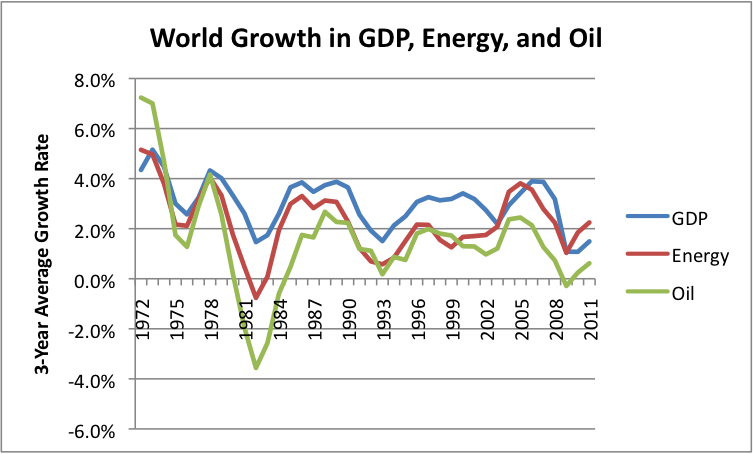 Growth in World GDP, energy consumption, and oil consumption. GDP growth is based on USDA International Macroeconomic Data. Oil consumption and energy consumption growth are based on BP’s 2012 Statistical Review of World Energy. (a) It becomes increasingly difficult to keep scaling up oil industry investment because of limits on debt availability, when heavy investment is made up front, and returns are many years away. As an example, Petrobas in Brazil is running into this limit. Some US oil and gas producers are reaching debt limits as well. (b) Greater use of oil within the industry leaves less for other sectors of the economy. Oil production has not been rising very quickly in recent years (Figure 6 below), so even a small increase by the industry can reduce net availability of oil to society. Some of this additional oil use is difficult to avoid. For example, if oil is located in a remote area, employees frequently need to live at great distance from the site and commute using oil-based means of transport. Figure 6. 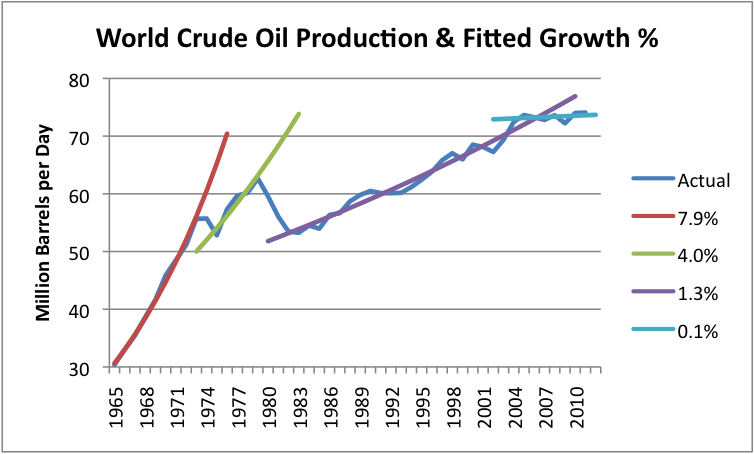 World crude oil production (including condensate) based primarily on US Energy Information Administration data, with trend lines fitted by the author. (c) Declining EROEI puts pressure on other limited resources as well. For example, there can be water limits, when fracking is used, leading to conflicts with other use, such as agricultural use of water. Pollution can become an increasingly large problem as well. (d) High oil investment cost can be expected to slow down new investment, and keep oil supply from rising as fast world demand rises. To the extent that oil is necessary for economic growth, this slowdown will tend to constrain growth in other economic sectors. High oil prices can be expected to cause discretionary sectors to shrink back in size. In many respects, the airline industry is the “canary in the coal mine,” showing how discretionary sectors can be forced to shrink. In the case of commercial air lines, when oil prices are high, consumers have less money to spend on vacation travel, so demand for airline tickets falls. At the same time, the price of fuel to operate airplanes rises, making the cost of operating airplanes higher. Business travel is less affected, but still is affected to some extent, because some long-distance business travel is discretionary. Airlines respond by consolidating and cutting back in whatever ways they can. Salaries of pilots and stewardesses are reduced. Pension plans are scaled back. New more fuel-efficient aircraft are purchased, and less fuel-efficient aircraft are phased out. Less profitable routes are closed. The industry still experiences bankruptcy after bankruptcy, and merger after merger. If oil prices stabilize for a while, this process stabilizes a bit, but doesn’t really stop. Eventually, the commercial airline industry may shrink to such an extent that necessary business flights become difficult. There are many discretionary sectors besides the airline industry waiting in the wings to shrink. While oil prices have been high for several years, their effects have not yet been fully incorporated into discretionary sectors. This is the case because governments have been able to use deficit spending and artificially low interest rates to shield consumers from the “real” impacts of high-priced oil. Governments are now finding that debt cannot be ramped up indefinitely. As taxes need to be raised and benefits decreased, and as interest rates are forced higher, consumers will again see discretionary income squeezed. New cutbacks are likely to hit additional discretionary sectors, such as restaurants, the “arts,” higher education, and medicine for the elderly. It would be very helpful if new unconventional oil developments would fix the problem of high-cost oil, but it is difficult to see how they will. They are high-cost to develop and slow to ramp up. Governments are in such poor financial condition that they need taxes from wherever they can get them–revenue of oil and gas operators is a likely target. To the extent that unconventional oil and gas production does ramp up, my expectation is that it will be too little, too late, and too high-priced. Wages include private and government wages, proprietors’ income, and taxes paid by employers on behalf of employees. They do not include transfer payments, such as Social Security. This entry was posted in Financial Implications and tagged airlines, Food prices, oil prices, tight oil, unconventional oil. Bookmark the permalink. Let me turn the question around and ask if there are any advantages to high oil prices. Most obviously, of course, is that to the extent that high oil prices reduce the size of the money economy, they have all sorts of ecological benefits. But over a longer term, high oil prices and a reduction in the size of the money economy also selects for humans who are capable of living more efficiently. If we take as examples of the most inefficient we can consider the very rich people that Nate Hagens describes having worked for–no matter how much they had, they wanted more, and were unhappy if they didn’t get it. Furthermore, happiness did not last if they did get what they wanted. High oil prices probably select these people right out of the gene and meme pool. When we look around for examples of people who are capable of living a good life with simple physical requirements, the question gets a little more complicated. Those of these kinds of people that we hear about are likely to live both a public and a private life. If their public life involves making extravagant use of travel to spread their message, we might cut them a little slack–but not too much. If we focus on the private lives, each of us can probably find people to admire: Thomas Merton at Gethsemani monastery in Kentucky; Thich Nhat Hanh at Plum Village in France; Ralph Nader in New York City; Thoreau at Walden Pond; an old hippie farmer I know who says that ‘if a man can’t be live well on $30,000 a year, he’s just not trying’. Some of these people also live very frugal public lives. We can also find examples of people with large public lives achieved frugally, such as Sharon Astyk. And I have heard about a mild-mannered actuary who ducks into alleys, strips down to her leotards, and flies through the air without benefit of fossil fuels, slaying errors. If high oil prices select for these kinds of people, and against the people Nate was working for, then the world will be a much better place. What we are talking about here is meme selection, as opposed to physical changes such as metabolic efficiency selection. Memes spread, but are also subject to decay (as we can see if we examine the differences between the dominant memes of the Depression generation and the Baby Boomer generation). Continued high oil prices would tend to keep the new memes in place. You should go into comedy writing. A mild-mannered middle-aged actuary in leotards flying through the air without fossil fuels would be strange sight, I am afraid. It would be nice if high oil prices select for people who can live the simpler life. There are certainly a lot of people in peak oil writing and in sustainability writing who are getting along on modest incomes. There are a few who are trying hard to figure out, “How can we make money from this?” Sometimes the latter is of necessity. It is hard to get along on zero income. Dmitry Orlov talks about the fact that it was the men who were all absorbed in their jobs, and lost them, who were most disturbed by the fall of the Soviet Union. The women kind of went on as before, since the things they were doing were less disturbed. There is an inborn instinct, especially in men, toward hierarchical behavior. This may be related as well. To some extent, people do what they are taught. Television advertising and economic teaching of today seem to suggest that “more stuff” is what life is all about. Some (but certainly not all) religious teaching is in the opposite direction. So is most of the sustainability discussion. I suppose there are a few sustainability folks where are interested in impressing the neighbors with their new Prius and new bamboo imported floors, though. I am sure you are far too young to remember Superman. So forgive the lame analogy. Superman, disguised as ‘Clark Kent, mild mannered reporter’ would regularly run into an alley and emerge in his tights and then jump into the air and fly around New York City. He fought for ‘truth, justice, and the American Way.’ I can’t remember the exact story of his super-powers, but he was from Krypton and there were atomic mishaps somewhere along the way. A couple of days ago I read a history of collapses, such as the dinosaurs, and the conclusion was that more metabolically efficient creatures tended to fill the new niches (such as us mammals). I can’t find the story anymore. One of the things which has amazed me for quite a long time is that humans use such crude methods to get a few feel-good hormones flowing. A man will go out and buy a two ton automobile and drive it around trying to feel good. A tiny little bit of electrical impulse in the right location in the brain can accomplish the same task…without having to move 2 tons. Now assume that almost everyone is trying to get the feel good hormones flowing by manhandling the world with increasingly hard to get energy. But a few people can feel good by meditating or fantasizing or whatever. It seems that those who can manage their own happiness without manhandling the world will be selected for. Since all you Peak Everything writers have mostly learned to live solely on the mindless adoration of your penniless readers, it seems like you may become the new royalty. Not to worry. Supermman has continued even into the 21st century, so I am easily old enough to remember it. There are a lot of differences in people. Some of us are naturally “cheap” to begin with. We get more of a thrill from figuring out which car is least expensive to own, or buying a house in a neighborhood where prices aren’t too high, than trying to impress others with the huge house or car we own. The book, The Millionaire Next Door, written back in 1998, sold very well. The millionaires were mostly pretty inconspicuous. The ones buying huge homes and cars were often ones who couldn’t afford them. Writers about peak oil have to get their excitement some way. I’m sure it varies. Having loyal readers helps. The thing you describe is called “mainstream”, no need to wonder. Having a big car and a big house are still number one status symbols. Watch any mainstream movie. Look at the new values in China, they are happily saying good-bye to the simple live of their ancestors. Look what they do just to be able to drive a car. Of course in Western societies, you have the more intellectual kind, but not too many. And it is passed on to the next generation, of course with the help of media and advertising. Any kid that wants to live in a 2-room apartment with its parents, when their friends all have big houses? How about the choice between going to work in an overcrowded subway, or maybe still prefer driving your air-conditioned mobile living room? Living simply and enjoying it, that is mostly a conscious choice, often later in life. Maybe helped by health issues, that is one of the few accepted reasons (like cycling to work). Even then, it reduces your social choices. You have less stories to tell, like where you drove last weekend, where you are going next holidays, the problems your son has building his new house, etc. I don’t believe living the simple way will become any kind of mainstream, until the time when many people are a lot poorer. But I also think that a conscious choice to learn and be creative instead of being entertained will also make people more stationary. I think a lot of people are just fooled into thinking “whats normal” so they often choose to drive around like crazy to visit here and there to feel “complete” (not to mention something to write on facebook). I often ask, show me your passions, show me something you master, don’t show me what you can buy and places you can visit with your money. There is no achievement in travelling to Egypt by plane, there is achievement in lecturing me about the history of Egypt and learn one of their crafts. I think people have become mindless zombies with the constant need to be entertained, that its very hard for many to even consider that its in their power to learn and master almost anything if they set their mind to it. I couldn’t help but laugh a bit inside when I heard my neighbors drive to a nearby ice rink to go ice skating, knowing it involved a drive, standing in a queue, skating with hundreds of others around you and most likely standing in a queue to buy snacks for the kids. My wife and I took a stroll with the kids around our neighborhood and found that a local duck pond had frozen solid thick ice and worked brilliantly as a makeshift ice rink – and the kids were having a blast. I also notice that kids around out playing as much, and neither do they visit each other much (if they do its to play video games). And I often watch and hear of parents taking the kids to the cinema, to the theater, to swimming, to MacDonalds, to whatever…. to entertain their kids. Don’t get me wrong, I don’t think we should keep kids from all kinds of activities, but does it have to happen every blasted weekend?!? That is the problem, the constant entertainment pressure is making parent into transportation and wallets because they are unable to say “no, not today kids, play outside please”. The fact is that energy is still so cheap today that we choose a lifestyle that involves a lot of jetsetting around. But its really not needed for any of us to live complete and happy lives, as there is a lot you can learn to master even in and around your home. It will also generally give you a less stressful life, and likely a safer one as well since your chances of getting killed in a car accident is minimized when you don’t have to drive around all the time (stressed out parents + cars = disaster). I recently put up an unofficial version of my Energy article (from a year ago), called, Oil Supply Limits and the Continuing Financial Crisis. It is on a separate “page” and can be reached at this link. Reblogged this on Mb50's "Liquid Mud" Blog.